There are several small cascades on Jim Brook, including one 50-foot section that drops a total of about 10-feet. About half of that drop is within a small gorge that has some flume-like properties. The tallest continuous drop you'll find is about 5 feet, and that's the section above the gorge. Reaching the falls requires a pleasant and easy family-friendly walk. 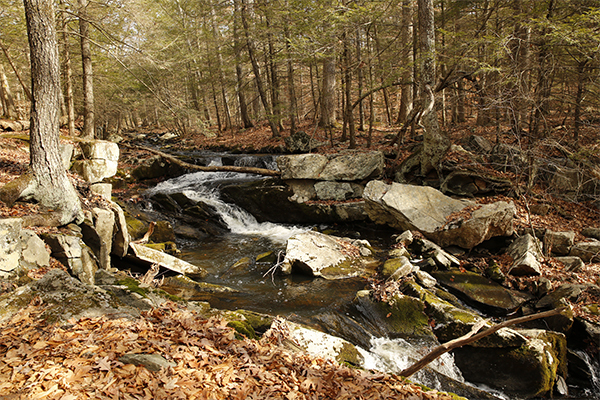 The falls are located on state-owned property that connect with the Roaring Brook Nature Center. The center itself is absolutely worth a visit, with several permanently injured and rehabilitating animals typically on site. My advice is to make a half day outing out of walking some or all of the trails located here as well as spending an hour or two visiting the nature center. Follow the red-blazed trail that starts behind the nature center. There are two red-blazed trails behind the building; take the southern one that follows Jim Brook downstream. 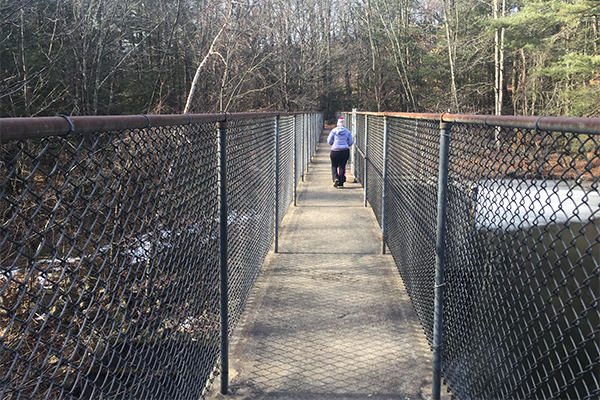 Follow this trail for 750 feet, and then cross a long and fenced-in concrete walkway over Werner Pond. After you exit the walkway, bear slightly left onto the yellow-blazed Quarry Trail. After hiking for 0.1 mile on the Quarry Trail, cross over Bahre Corner Rd. About 100 feet after re-entering the woods, you'll reach a fork. Fork left and in 0.1 mile you'll rejoin the brook. You'll see some small cascades here, but the main falls and gorge are about 300 feet downstream. This is an easy and very family-friendly hike. From the junction of CT 167, US-202, and US-44 in the section of Simsbury known as Crowleys Corner, take US-202 and US-44 west for 1.1 miles and turn right onto Lawton Rd. Follow Lawton Rd for 0.8 mile (bearing left at 0.2 mile to stay on the road) and you will reach a major curve in the road. Bear right, drive 100 feet and then turn left onto Gracey Rd. 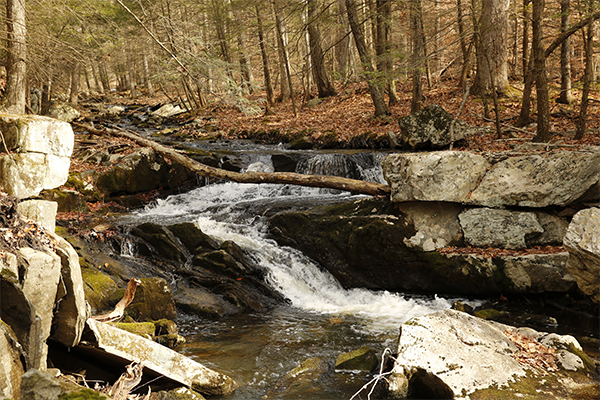 Follow Gracey Rd for 0.4 mile and pull into the Roaring Brook Nature Center on your left. To get to Crowleys Corner, take US-44 west from Hartford or US-202 east from Torrington. There are several miles of trails accessible from the nature center, and you can easily make your trip to the falls part of a longer loop. In 2017, there was a kiosk with a trail map near the parking area. 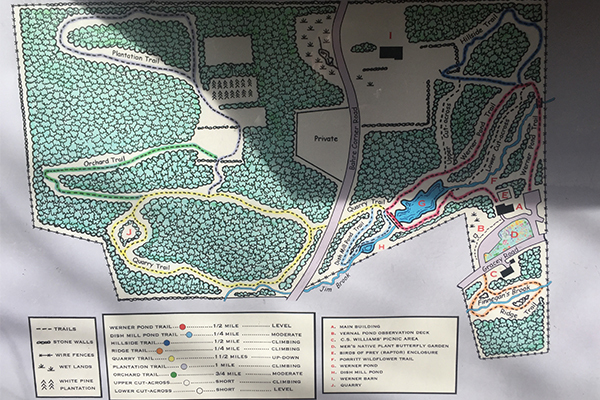 The website for the nature center also includes a PDF map of all trails on the property.